The old Thai capital of Ayutthaya, a UNESCO World Heritage Site, is one of the most impressive ruined cities in Asia and a must-see for history buffs visiting Thailand. The Menam, Lopburi, and Pasak rivers ring Ayutthaya Historical Park, the island where most of the temple ruins lie. Wandering through this once-thriving ancient city will make you feel like you've stepped back in time. Besides exploring all the temple ruins, other popular things to do include caring for rescued elephants and biking through the old French, Portuguese, British, and Dutch quarters. Allow at least two days to see all the tourist attractions, and longer if you don't want to feel rushed. Ayutthaya is steeped in history, and you'll want to absorb the full experience while you're here. Restoration efforts starting in 1987 transformed Wat Chaiwatthanaram from a looted ruin to one of the most visited attractions in the Ayutthaya Historical Park. This large complex on the west bank of Chao Phraya river is one of Ayutthaya's most impressive temples and offers insight into the influence of Buddhism on the Thai community. Built in the traditional Khmer style, the complex consists of a central prang or spire perched atop a rectangular base amid four smaller prang and eight chedi-like temples or merus. Reliefs portraying scenes from the life of the Buddha once adorned the exterior of the merus, but only fragments now remain. Sunset is an especially beautiful time to visit, when the buildings glow in the late light. Wat Phra Si Sanphet is the loveliest but also the most historically important temple in old Ayutthaya. Its three large chedis and numerous smaller ones make this wat - also known as the King's Temple - one of the most impressive sights in the ruined city. Two of the large chedis, the eastern and central ones, were built in 1492 by King Ramathibodi II to house the ashes of his father and elder brother. His own ashes are interred in the third chedi, built in 1530 by his son and royal successor, King Boromaraja IV. All three chedis were plundered by the Burmese, though they failed to find the hundreds of small Buddha statues in bronze, crystal, silver, lead, and gold now on display in the National Museum, one of the top attractions in Bangkok. Other smaller Buddha figures were also taken to the capital to be placed in Wat Buddhaisawan (now also part of the National Museum in Bangkok) and the western wiharn of Wat Pho. You'll see the ruins of Wang Luang, the Grand Palace, to your left as you leave the wat. Nothing is left except the foundations, as the palace was thoroughly destroyed by the Burmese. King Boromracha II (1424-48) had Wat Ratchaburana built in memory of his elder brothers Ay and Yi, who were killed in a duel over the succession to the throne. Columns and walls of the wiharn still stand, as do some ruined chedis. The large prang, with its fine figured stucco portraying nagas supporting garudas, is exceptionally well preserved. You'll find some interesting wall paintings in the two crypts in the lower part of the prang, likely the work of Chinese artists who settled in Ayutthaya and had the skill to harmonize such different styles as those of the Khmer and Burmese, Lopburi, and Sukhothai. Two more chedis at the crossroads house the ashes of the royal brothers, while a third commemorates Queen Si Suriyothai who, during a battle with the Burmese in about 1550, dressed as a man and rode into the fray on a white elephant to save her husband's life - but lost her own in the process. Immediately across the road from Wat Ratchaburana stands Wat Mahathat, which tradition claims King Ramesuan built in 1384. Its most famous feature is the face of a stone Buddha peeking out from among the roots at the base of a tree. The central prang here is one of the old city's most impressive edifices. In about 1625, the top portion broke off, being rebuilt in 1633 some four meters higher than before. Later, it collapsed again and only the corners survived. In 1956, a secret chamber was uncovered in the ruins. Among the treasures found inside were gold jewelry, a gold casket containing a relic of the Buddha, and fine tableware. On the eastern outskirts of Ayutthaya stands the exceptionally striking Wat Yai Chai Mongkol (or Mongkhon), its huge chedi rising from a square base surrounded by four smaller chedis. One of its most notable features is the massive reclining Buddha near the entrance. The wat, built in 1357 under King U Thong, was assigned to monks of a particularly strict order trained in Sri Lanka, members of which still live there. Before you leave, climb the stairs of the chedi for views over the statues and gardens. Opposite the Grand Palace, Wat Na Phra Men (also called Wat Na Phra Meru) is one of the few temples to have escaped destruction by the Burmese. It is not known when the temple was built; existing records show merely that it was restored under King Boromakot (1732-58) and again during the early Bangkok period. The bot (largest room in the temple) is large and imposing, with beautiful wood carvings on the gable and door panels. Strangely, a large figure of Buddha found here is dressed in royal garb, which is highly unusual. Just outside of the Ayutthaya Historical Park, this large working temple has long been overgrown, but the ruins are still considerable. You can see sections of the terrace, the pillars of the portico, and a chedi encircled by lion statues. A curiosity here are the dozens of brightly colored rooster statues, thought to be offerings brought by locals. Other highlights include the large bronze Buddha head and the golden reclining Buddha hidden in one of the buildings to the right of the chedi. Set in several buildings surrounded by lily ponds, Chao Sam Phraya National Museum was founded by King Bhumibol Adulyadej in 1961. It houses a number of sculptures and works from different periods throughout Thailand's early history, including several superb golden Buddha statues; gold jewelry and utensils, and ornate teak friezes. Highlights are a seated Buddha and a huge bust of the Buddha in the U Thong style. Wat Suwan Dararam stands proudly surrounded by three small lakes. Built around 1700 by the grandfather of Rama I, it was extended by the rulers of the Chakri dynasty, who also carried out a considerable amount of restoration work and decorated the temple with numerous paintings, which are now among its best known features. Murals in the temple depict subjects such as Buddha's struggle against Mara while obtaining enlightenment, as well as battles with mythical figures and a dramatic battle scene between King Naresuan the Great and the Burmese army. Wat Suwan Dararam is the only temple on Ayutthaya island still inhabited by monks. If you tire of seeing ruins and are looking for a little more modern regality, head to Bang Pa-in Palace, dating to the 17th century. Also known as the Summer Palace, this royal residence is one of the best-preserved compounds in the area. The buildings feature several architectural styles, including traditional Thai and Chinese structures, and there's also Phra Thinang Uthayan Phumisathian - a two-story Victorian style mansion. Another interesting spot is Ho Witthunthassana, the three-story, tower-style building used for scoping out the countryside and watching for royal elephants. 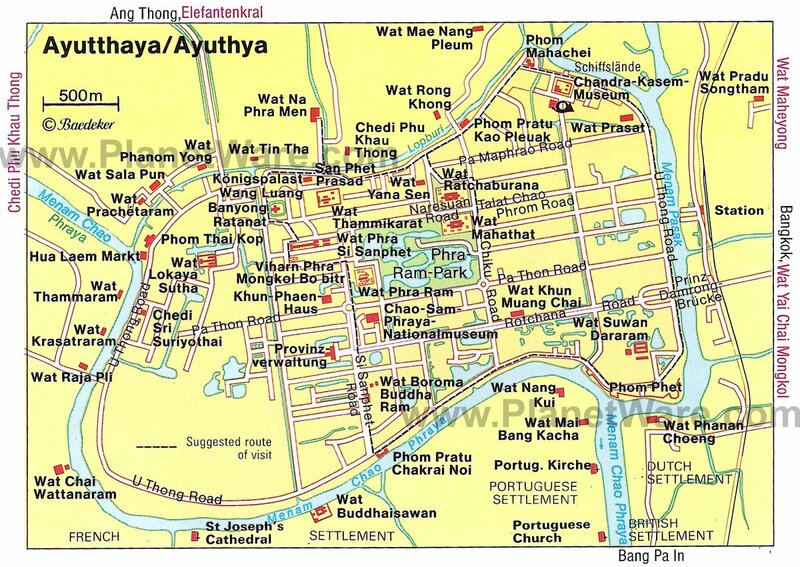 In its glory days, Ayutthaya drew settlers from all over the world, making the city a diverse and cosmopolitan one. As you'll see from a map, many of these foreign quarters lie quite close to one another, so you can visit the old French, Portuguese, British, and Dutch quarters by taking a sightseeing bike ride through the area. The European influence is responsible for the number of Catholic churches in the area, including St. Joseph's Church, which still stands today. Located in the French quarter, the church was built in 1666 and is a testament to the French settlers, who left home to settle in what was formerly Siam. Ayutthaya also had a strong Japanese presence, and you can still explore an old Japanese quarter here. The riverside Japanese settlement was separate from the European ones, divided by the Suan Phlu Canal. Tourists can bond with one of Thailand's most revered animals by spending a few days at the Elephant Stay. The minimum booking is three nights and includes an elephant you'll care for under the watchful eye of experienced mahouts throughout the duration of your stay. Guests feed, bathe, and ride their assigned elephants. This organization is a non-profit devoted to conservation and supporting retired elephants. It also operates an active breeding program and rescue and rehabilitation program. 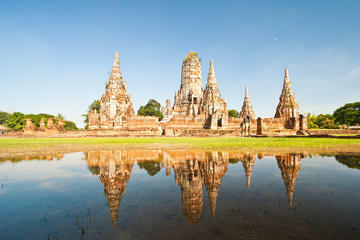 Luxury Hotels: Ayutthaya has few luxury options, and they lie a drive from the historical park. The best of these include the Kantary Hotel, 14 minutes by car from the ruins, and the Classic Kameo Hotel & Serviced Apartments, a little closer to the historical park. Both offer apartment-style accommodation, buffet breakfasts, and swimming pools. Set in lush gardens, steps away from the floating market, Baan Thai House exudes authentic Thai style with its teak villas, spa, and peaceful pool area. Mid-Range Hotels: Close to the night market, Ayutthaya Grand Hotel offers large, clean rooms as well as a pool and gym. In the center of town, the older Ayothaya Hotel has a swimming pool and great-value rates, which include a hearty breakfast, while Prom Tong Mansion is a more intimate option, steps away from the ruins. Budget Hotels: Near restaurants and entertainment and less than a five-minute walk from the closest temple, Goodmorning by Tamarind Guest House scores rave reviews for its friendly staff and great-value rooms. Bikes and scooters are available for rent. Other budget options include Adam Place, with free bikes and basic but spacious rooms, and the hip Stockhome Hostel Ayutthaya, which offers dorm rooms and private rooms within walking distance of the historical park. Ayutthaya Temples and River Cruise: If you want to see all the highlights of Ayutthaya from Bangkok in one day, the Temple and River Cruise tour is a fantastic option. An experienced guide takes you to Ayutthaya Historical Park to see the prime sites, including Wat Phra Si Sanphet, Wat Phanan Choeng, and Wat Yai Chai Mongkol. You'll also visit King Rama IV's summer palace. For the return trip to Bangkok, hop aboard a riverboat for a relaxing cruise along the Chao Phraya River, gliding past magnificent temples on the banks of the river. The tour includes lunch, entrance fees, and pickup and drop-off from central Bangkok hotels.